In mid-August 2014, the escalation of conflict in Iraq precipitated a large influx of Internally Displaced Persons (IDPs) into the Kurdistan Region of Iraq (KRI). This brought about the setup of several spontaneous settlements as well as the sudden development of a few planned camps across the region. In this context, REACH and the Camp Coordination and Camp Management Cluster (CCCM) recognized the need for an operational overview of overall conditions in camps and informal sites, as well as the existing differences between displacement sites. 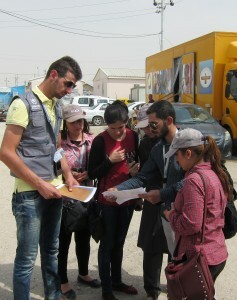 Subsequently in September 2014, REACH launched a camp and site profiling project of formal and informal IDP sites in the KRI and disputed areas of Ninewa and Diyala. The project was planned in several phases; the first phase which was launched in October 2014 aimed to create a baseline overview of needs and gaps in the camps. This was followed by a second and third phase in January and September 2015 respectively to monitor developments over time as the response continued. In October 2015, a first round of profiling was also launched for camps in Baghdad and Missan. The methodology used for profiling consists of household level assessments sampled at the camp/ site level and accompanying infrastructure and spatial analysis, and includes multi-sectoral indicators as agreed with CCCM cluster and other cluster leads. The latest factsheets from the third round are available for the following camps on our Resource Centre: Aiden, Alwand 1, Ashti, Baharka, Bajed Kandala, Bardarash, Bersive 1, Chamisku, Dawudiya, Essian, Garmawa, Harshm, Kabarto 1, Kabarto 2, Khanke, Mamilian, Qoratu, Rwanga Community, Shariya, and Sheikhan. The overall aim of this project is to inform humanitarian response to IDPs living in camp settings at an operational and strategic level. At an operational level, profiles produced in the past have been used by implementing agencies to design and monitor areas of intervention. The profiles also provided camp management with an overview of ongoing developments as well as priority needs and gap areas on which to focus. At the strategic level, the profiles enhanced programme development and allowed donors to gain a comparative understanding of camps within and between governorates. The profiles also provided an overview of capacity and potential for future developments and contingency planning. Therefore, going forward, the project seeks to facilitate the identification of needs and response gaps to support the upcoming Humanitarian Response Plan (HRP), as well as to allow camp management to more easily monitor service delivery and changing conditions over time.